Recently I have been having a problem. The problem is not earth shattering, just irritating, especially to my wrist. The problem is my watch. I like this watch; it is very dressy and is designed to wear in a business atmosphere. On my left arm just under the one of the legs of my watch is a sore. 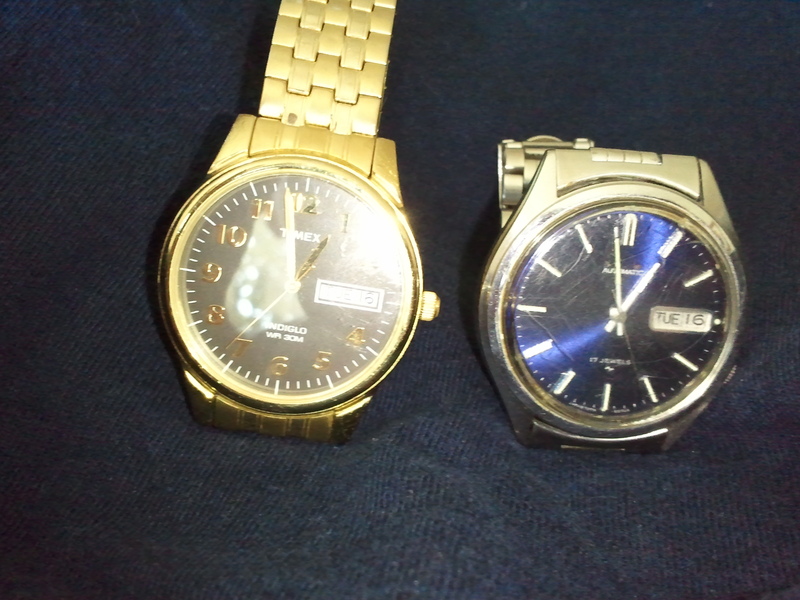 It is caused because my body creates an acid that causes the metal of the watch to become very rough. The rough surface of the watch leg then rubs on my arm and causes a sore. I bought a bottle of clear fingernail polish and painted the rough edges making sure I put lots on the roughest parts. That was a week ago. I noticed this morning that the sore had not gone away completely; it was better, but not gone. The next step was to paint more polish on the watch. This time instead of wiping the brush against the edge of the bottle opening I applied a heavier coat of polish. While it was drying I wondered if I had any watches stashed away in a drawer. In the top drawer of my dresser I found a small red box that concealed an old watch that I cherish because my wife had given it to me for Christmas many years ago. It is heavier than the watch I currently wear, but it is a work horse. This old friend is a blue faced Seiko self-winding model. How long has it been since you have seen a self-winding watch of any kind? I had taken it off more that 25 years ago after I retired from the army and started a new career in carpentry. Not wanting to damage the Seiko I took it off and bought a cheap watch (and there were many over the years) to wear on job sites. After retiring from carpentry and moving back into an office environment I forgot about my old friend. I continued to wear the cheap ones until my wife bought me the one that is giving me problems now. I do not plan on getting rid of this watch, I will wear it when I need to dress up for those special occasions. I give thanks that I did not get rid of this watch. It may not be the dressiest watch around, but it not by any means the ugliest, it is built to last. It has served me well over the years and will serve me for many more years to come. Previous Article Whose Country Is It? Next Article What is Welcoming?